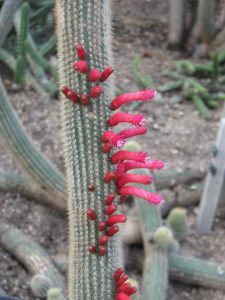 “Closed cactus” referring to the tubular flowers that open only very slightly. A genus of shrubby plants with erect, often slender, cylindrical stems, shape variable, pendulous, prostrate, creeping or pending. Central and radial spines poorly differentiated. Flowers diurnal, narrowly tubular, almost closed, more or less hairy, straight or slightly curved, yellow, orange, red to purplish red, pink, green, or sometimes bicoloured or even tricoloured, pollinated by hummingbirds. Fruits small, scaly, spherical, splitting when ripe. Seeds many, small, shinyrblack, globose to pyriform (pear-shaped), striate, often foveolate. The genus Cleistocactus grows in dry, semi-arid woodlands, among thorny bushes, or in full sun, mainly in the Andes from 100 m up to 3000 m in altitude. The species found at higher altitudes (C. hyalacanthus, C. jujuyensis) are found in high valleys, in mineral, sometimes schistose substrates. Others (e.g. C. ritteri) live in deep valleys with a tropical climate. Some species such as C. baumannii are highly variable and a subspecies (C. baumannii subsp. horstii) lives at 100-200 m above sea level in an area near the Grand Pantanal wetlands in Brazil, where the average annual temperature is 25°C, and rainfall is than 1000 mm/year. Argentina (Catamarca, Chaco, Cordoba , Corrientes, Entre Rios, Formosa, Jujuy, La Rioja, Salta , Santiago del Estero, Santa Fe, Tucuman), Bolivia (Chuquisaca, Cochabamba, La Paz, Potosi, Santa Cruz, Tarija), Brazil (Mato Grosso), Paraguay (Alto Paraguay, Boqueron, Concepcion, Cordillera, Paraguari, Presidente Hayes), Peru (Apurimac, Ayacucho, Huancavelica).